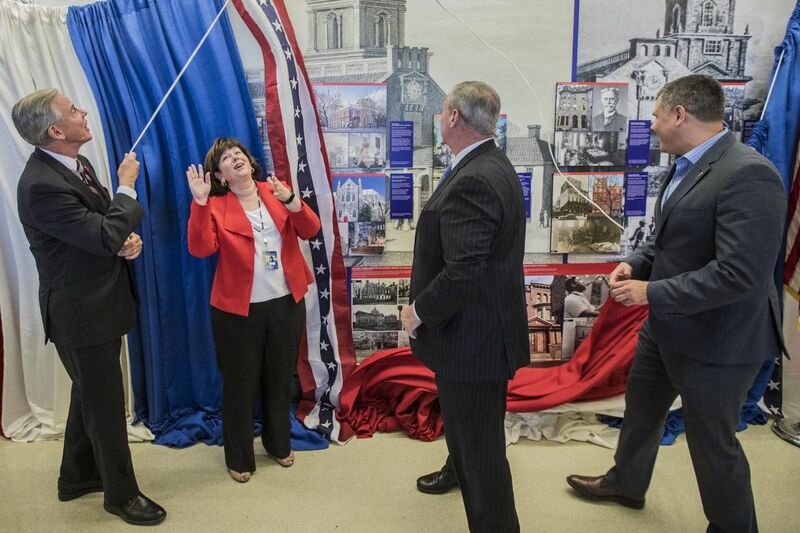 Chellie Cameron, Airport CEO, second from left, reacts as the bunting that was hiding the new art exhibit at the airport was pulled down by John Smith, left, Board Chair of Global Philadelphia Association, Mayor Jim Kenney, and Jeff Guaracini, Director of Wawa Welcome America, on Wednesday, June 28, 2017. Philadelphia has 67 National Historic Landmarks and for the next year they will all be within a hundred feet. Adorning the walls of Philadelphia International Airport. What famous historical figure would you most like to have dinner with? The exhibition, unveiled Wednesday in Terminal A-East, is a montage of photos, both historic and present day, of the homes, hospitals, halls, churches, cemeteries, libraries, and financial institutions made famous by what happened there, or the men and women who lived in or designed them. Detail of the exhibit that features the Race Street Friends Meeting House. It is the only spot where painter Charles Willson Peale, paleontologist Edward Drinker Cope, and poet and abolitionist Frances Ellen Watkins Harper are likely to rub shoulders with jazz saxophonist John Coltrane, botanist John Bartram, painter Thomas Eakins, and architect Frank Furness. The exhibit was created by airport chief curator Leah Douglas and celebrates "Philadelphia: the nation's first World Heritage City." The designation was given to the city in November 2015 because Independence Hall is a UNESCO World Heritage site. "We welcome 82,000 people to our airport each and every day, a little over 30 million a year," said airport CEO Chellie Cameron. "This exhibit is going to have great exposure for Philadelphia and for the World Heritage City status." Cameron was joined by Mayor Kenney and others to unveil the exhibit, which will be on display for a year. But you'll need a plane ticket to get through airport security to see it. This is the 10th year that Douglas has come up with a Philadelphia theme to coincide with July 4 and the Wawa Welcome America festivities. She worked with Global Philadelphia, a group that promotes the city's international ties and secured Philadelphia as the first U.S. World Heritage City, one of 280 around the world. "It is primarily a tourism and hospitality boost," Douglas said. "It's also important to our preservation institutions. You hear they are going to tear something down, and they shouldn't. It gives a nudge to the importance of maintaining and keeping some of these important historical institutions or buildings." Philadelphia's 67 national historic landmarks are scattered throughout neighborhoods from Germantown to Southwest Philadelphia, Mount Airy and University City, to North Philadelphia and Center City. Two are ships: the USS Becuna, a World War II submarine, and the USS Olympia, a naval cruiser in the Spanish-American War. Both are at the Independence Seaport Museum. Schell Hatcher (right) points out some of the historical sites of Philadelphia she knows, to her fellow airport workers after the new art exhibit revealed at the airport on Tuesday. Many were notable Philadelphia "firsts" — the Academy of Music, America's oldest musical auditorium in continuous use; Eastern State Penitentiary, America's first penitentiary; Friends Hospital, the oldest private psychiatric hospital; Merchant's Exchange, the oldest stock exchange building; Pennsylvania Hospital, the earliest public hospital; the First Bank of the United States, completed in 1797; and Mother Bethel A.M.E., the oldest African Methodist Episcopal church. Today some buildings are privately owned residences: the Henry O. Tanner, Thomas Sully, and Coltrane homes. The Eakins House is now home to the Philadelphia Mural Arts Program. The Insurance Co. of North America (INA), at 1600 Arch St., is condominiums. The United States Naval Asylum on Grays Ferry Avenue is Naval Square private residences. The Philadelphia Savings Fund Society (PSFS) Building is the Loews Hotel at 12th and Market. The Reynolds-Morris House on South Eighth Street is the Morris House Hotel. The former Philadelphia School of Design for Women on North Broad Street is the Freedom Theatre. The Peale House is the office of the president at La Salle University. "People come here from around the world, and we welcome them," Kenney said. "Unlike some of the noise and nonsense you are hearing nationally, we don't build walls around the airport. We don't try to push people out. We try to bring people in. In Philadelphia, you can meet your potential. So we welcome the world." This article has been changed to correct the name of Frances Ellen Watkins Harper.